Anyway, enough of that. 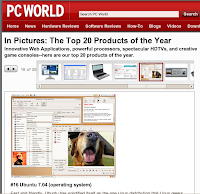 PC World have listed Ubuntu at number 16 in their top products of 2007, so they’re not all bad. I think maybe we could have done a bit better than number 16 but forgetting that for now I hope it increases public awareness of this great OS. I don’t know what kind of audience this product review has but I suppose any kind of exposure is good for Ubuntu. It can’t hurt can it.